Template:US County infobox Bergen County is a county located in the state of New Jersey. As of 2000, the population is 884,118. Its county seat is Hackensack6. 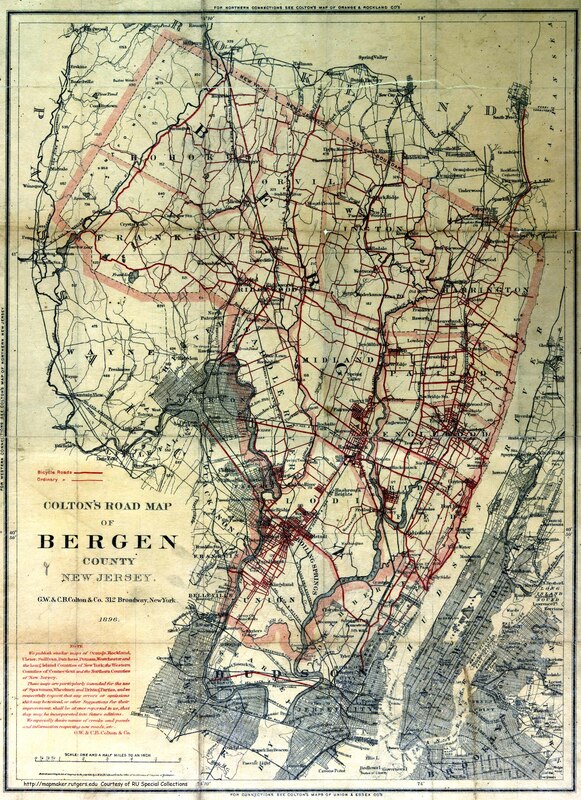 Bergen County was established in 1683 while the territory was called East Jersey, a proprietary colony (as opposed to a royal colony). At the time, Bergen was one of only four counties in East Jersey. 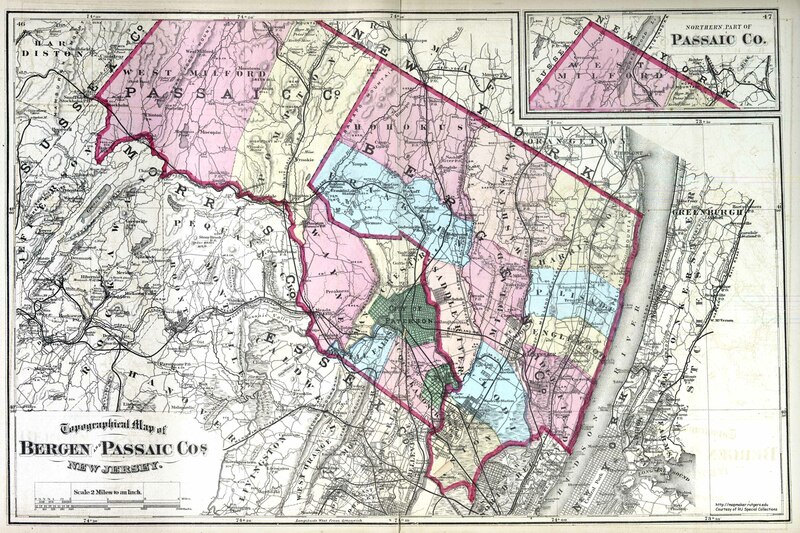 Its territory also included the current territory of Hudson County (formed in 1840), and portions of Passaic County (formed in 1837). Bergen saw several battles and troop movements during the American Revolution. Fort Lee's location on the Hudson River made it a strategic position during the war. According to the U.S. Census Bureau, the county has a total area of 639 km² (247 mi²). 606 km² (234 mi²) of it is land and 33 km² (13 mi²) of it is water. The total area is 5.12% water. The highest elevation is Bald Mountain near the New York state line in Mahwah, at 1,164 feet (355 m) above sea level. The lowest point is sea level, along the Hudson River. The sharp cliffs of the Palisades lift much the county up from the river along the eastern boundary with the Hudson River, but then relief remains relatively minimal across the county as much of it is in the Hackensack River valley. Only in the northwestern portion of the county are any serious hills found, leading to the Ramapo Mountains. 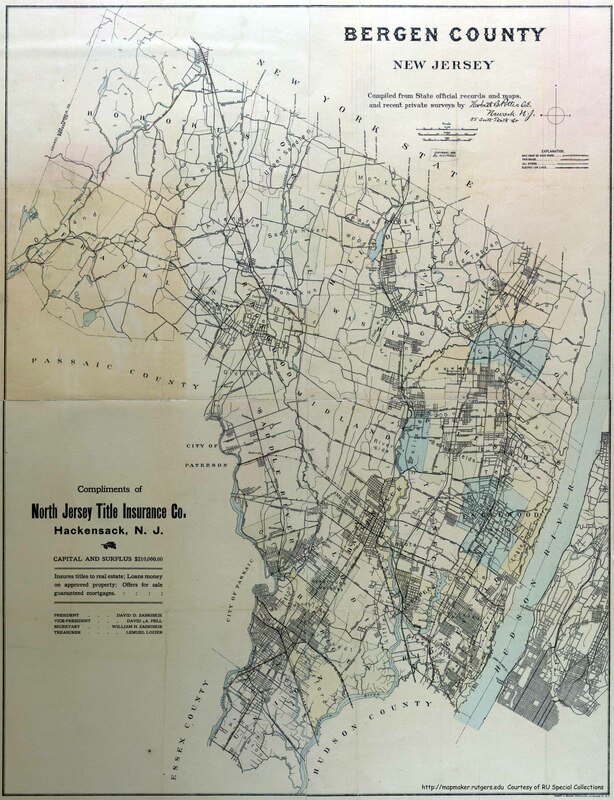 The daming of the Hackensack River (and tributaries) produced three reservoirs in the county, Woodcliff Lake Reservoir, Lake Tappan and Oradell Reservoir, which provide drinking water to much of northern New Jersey. Bergen County is bordered by Rockland County, New York to the north, the Hudson River to the east, Hudson County to the south, a small border with Essex County also to the south and Passaic County to the west. Bergen has had a County Executive form of government since 1986. The executive, along with the Board of Chosen Freeholders administrate all county business. Two federal Congressional Districts cover the county, with the northern portion of the county in New Jersey's 5th district, represented by Scott Garrett (R) and the southern portion of the county in New Jersey's 9th district, represented by Steve Rothman (D). Bergen county has a well-developed road network, including the northern termini of the New Jersey Turnpike (a portion of Interstate 95) and the Garden State Parkway, the eastern terminus of Interstate 80 and a portion of Interstate 287. US Highways 46, 202, 9, 9W, and New Jersey state highways 4, 17, 3, 120, 208, and the Palisades Interstate Parkway also serve the region. Access to New York City is primarily available for motorists through the George Washington Bridge in Fort Lee and the Lincoln Tunnel in Hudson County. Train service is available on three lines from New Jersey Transit, the Bergen County Line, the Erie Main Line and the Pascack Valley Line. They run north-south to Hoboken Terminal with connections to the PATH train. The Hudson-Bergen Light Rail will connect the county with Hudson County in the near future. There is also bus service, available from New Jersey Transit and private companies such as Red and Tan Lines and DeCamp Bus Lines. The only airport in the county is Teterboro Airport in Teterboro. Most commercial air traffic is handled by nearby Newark Liberty International Airport in Essex County. As of the census2 of 2000, there are 884,118 people, 330,817 households, and 235,210 families residing in the county. The population density is 1,458/km² (3,776/mi²). There are 339,820 housing units at an average density of 560/km² (1,451/mi²). The racial makeup of the county is 78.41% White, 5.27% Black or African American, 0.15% Native American, 10.67% Asian, 0.02% Pacific Islander, 3.22% from other races, and 2.26% from two or more races. 10.34% of the population are Hispanic or Latino of any race. There are 330,817 households out of which 32.10% have children under the age of 18 living with them, 57.90% are married couples living together, 9.70% have a female householder with no husband present, and 28.90% are non-families. 24.70% of all households are made up of individuals and 10.20% have someone living alone who is 65 years of age or older. The average household size is 2.64 and the average family size is 3.17. In the county the population is spread out with 23.00% under the age of 18, 6.60% from 18 to 24, 30.60% from 25 to 44, 24.50% from 45 to 64, and 15.20% who are 65 years of age or older. The median age is 39 years. For every 100 females there are 92.80 males. For every 100 females age 18 and over, there are 89.40 males. The median income for a household in the county is $65,241, and the median income for a family is $78,079. Males have a median income of $51,346 versus $37,295 for females. The per capita income for the county is $33,638. 5.00% of the population and 3.40% of families are below the poverty line. Out of the total population, 4.90% of those under the age of 18 and 5.90% of those 65 and older are living below the poverty line. Bergen is the most populous of the counties in New Jersey, leading Essex County by approximately 90,000 people. Bergen has some 45 public high schools, see this list. It also has at least 18 private high schools, see this list. Bergen is also the home to the New Jersey Naval Museum in Hackensack. There the USS Ling is moored in the Hackensack River and is available for tours. This page has been accessed 5963 times.